Welcome one and all to another exciting episode of Otters Oddities. Although, I suppose episode isn’t really the correct word, is it? Episode would be if my Oddities were on TV or the radio. Or a podcast. Since this is a blog, and blogs involve writing, I suppose I should pick a word that describes the written word. Chapter won’t work. Because this is a single post, not a book. I suppose I could use installment, but that sounds like a loan payment and not a post. And I can’t really call it a rambling since that word describes what I do, not what this is. The heck with it. I’m calling it an entry. So, welcome one and all to the latest entry of Otters Oddities. Take a good look at the picture I have posted. Do you know who she is? No, really....I’m asking because no one knows who she is. Her identity is a mystery. Yet, many people have interacted with her. Some of you may recognize the mask. For many years it was a popular piece of art that hung in many homes around the world. Which I think is odd, (and that’s saying something if I think it’s odd), because it’s a death mask. 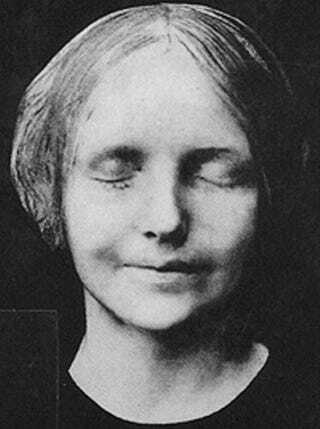 Death masks were typically made of famous people for posterity, or of beloved family members so you could remember them, or as was the case with this one, made by the police to help identify the unknown victim after she was buried. The exact date that her body was found is lost, but it was in the late 1880's. She was fished out of the Seine river in Paris. Doctors examining the body found no evidence of violence, so they suspected suicide. They also estimated her age at 16. The mask was used to try and identify the young lady, but her identity is, alas, destined to remain a mystery forever as police never had any luck finding anyone who knew who she was. But that’s not to say she didn’t achieve a small amount of fame. The mask was christened L’Inconnue de la Seine or The Unknown Woman of the Seine. For some reason, in the United States it’s known as La Belle Itialienne. It must be out rebellious nature, I guess. Sometime shortly after 1900 it became trendy for artists and writers to hang the mask as art in their homes. Many writers even used her as a subject for short stories, poems and even a ballet. But, you remember how I said you might know her? Well, if you’re like me and have had, at some point in time, taken first aid training, you will recognize her as Resusci Annie. (sometimes known as Rescue Annie). For those of you who don’t know, Resusci Anni is the training dummy used to teach mouth to mouth resuscitation. In the mid 1950's a Dr. Peter Safar developed a method of assisted breathing that greatly increased the chances of survival for someone who had stopped breathing. And when combined with C.P.R. it could, very literally, bring someone back from the dead. Dr. Safar presented his findings in the American Journal of Medicine in 1958, and the findings were impressive and promising. There was only one problem. How do you teach people how to do it? Not to many people would be willing to lock lips with a total stranger and have them blow air into their lungs. But Safar just knew that if you could teach the general public how to do this, many lives could be saved. So Safar contacted a Norwegian toy maker named Asmund Laerdal and asked if he could make a realistic mannequin that would fill the requirements. Now, Laerdal was an artistic sort of person. And he needed a face for his mannequin. And he had the perfect one hanging on his wall. He modeled Rescusi Annie after L’Inconnue de la Seine. So whole generations of people all over the world have learned how to save lives by practicing mouth to mouth on a young girl who died nameless over 130 years ago.